The STAAGE can be finished with a wide variety of RAL colors. These paints can be applied to the frame and components of the STAAGE. A lower landing gate (see picture on the left) is available as an option. 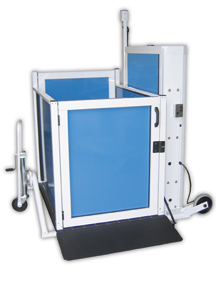 The upper landing call station is adjustable to adapt to the lifting height of the application.